James Marshall was camped on the American River at Coloma, near Sacramento. He and his crew were building a saw mill for a fellow named John Sutter. On the morning of January 24, 1848, while making adjustments to the millrace, he found a few small nuggets of gold. Nine days later, the Mexican-American war was over. Mexico gave up the state of California with the Treaty of Guadalupe and California became a U.S. territory. 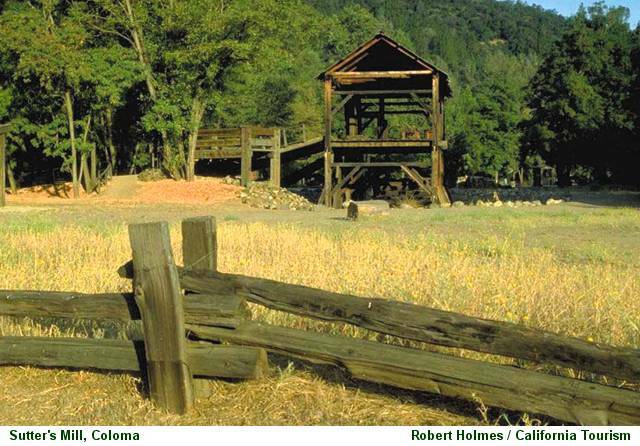 Sam Brannan, a young newspaper man in San Francisco began to hear rumors of gold at Sutter's Mill and decided to go find out for himself. Indeed, he found the place swarming with prospectors, some quite wealthy. It is said that, being an industrious man, Sam settled at Morman Island on the American River and began to collect "the Lord's tithes"(10% of their gold) from the miners who passed by. On September 9, 1850, the United States Congress hesitatingly voted to admit another free state to the union. It was called California. It's thought that the name California comes from a sixteenth century novel, Las Sergas de Esplandian by Garcia Ordonez de Montalvo. Spanish explorers Hernando Cortez and Ortuno Ximenez were familiar with the work of Montalvo and probably named the territory after the gold laden island described in the novel. (Official) California's long association with gold make this a natural nickname for the state. From the naming of the state in the 16th century to the California Gold Rush of 1848 and the fields of yellow poppies(official state flower) that bloom in the springtime, gold, in one form or another, has been intertwined with the history and development of California. The state legislature made "The Golden State" the official nickname of California in 1968. "The Golden State" is not the only nickname that has been associated with California. Over the years, California has been referred as "The Land of Milk and Honey" and "The El Dorado State" and "The Grape State." These nicknames served at various times to promote business and tourism for the state of California. A nickname promoting California as a land of opportunity with connections to "The Promised Land" of the Bible . Referencing the large quantities of table and wine grapes grown in California, the nickname The Grape State is based in the business of agriculture. A first nickname for California was "The Eldorado State." This nickname was used for California after the discovery of gold in 1848. People who live in California or who come from California are called Californians. One man born in the State of California attained the office of President of the United States. Richard Milhous Nixon: Richard Nixon was born in Yorba Linda, California on January 9, 1913. He served for eight years as Vice President under Dwight Eisenhower from 1953-1961, but lost the presidency narrowly to John F. Kennedy in the 1960 election. Eight years later, he returned to presidential politics to defeat Vice President Hubert Humphrey in 1968. Under the cloud of the Watergate investigation, Richard Nixon became the only President of the United States to resign from office. The first quarter released in 2005 honors California, and is the 31st in the United States Mint's 50 State Quarters® Program. California was admitted into the Union on September 9, 1850, becoming our Nation's 31st State. Nicknamed the "Golden State," California's quarter depicts naturalist and conservationist John Muir admiring Yosemite Valley's monolithic granite headwall known as "Half Dome" and also contains a soaring California condor. The coin bears the inscriptions "California," "John Muir," "Yosemite Valley" and "1850." In 1849, the year before California gained statehood, the family of 11-year-old John Muir emigrated from Scotland to the United States, settling in Wisconsin. In 1868, at the age of 30, Muir sailed up the West Coast and landed in San Francisco. He made his home in the Yosemite Valley, describing the Sierra Nevada Mountains as "the Range of Light... the most divinely beautiful of all the mountain chains I have seen." He devoted the rest of his life to the conservation of natural beauty, publishing more than 300 articles and 10 books that expanded his naturalist philosophy. In 1890, Congress established Yosemite National Park, and in 1892 John Muir helped form the Sierra Club to protect it, serving as that organization's President until his death in 1914. The 20-member California State Quarter Commission was formed to solicit design concepts from California citizens and to review all submissions. The Commission forwarded 20 design concepts to Governor Gray Davis's office for further consideration. From these, five were chosen as finalists and sent for final review to the United States Mint. Governor Arnold Schwarzenegger chose the final selection from this group of five. The four other design concepts considered included "Waves and Sun," "Gold Miner," "Golden Gate Bridge," and the "Giant Sequoia" design. The Department of Treasury approved the "John Muir/Yosemite Valley" design on April 15, 2004. California (From Sea to Shining Sea) , by Teresa Kennedy. 80 pages. Publisher: Scholastic Library Publishing (March 2008) Reading level: Grades 3-5. Presents information about California's people, geography, history, landmarks, natural resources, government, state capitol, towns and cities, and more. California (World Almanac Library of the States) , by Scott Ingram. 48 pages. Gareth Stevens Publishing (January 1, 2002) Reading level: Grades 4-6. Filled with the most up-to-date information, including the latest Census results. Full-color photos bring to life the story of California. In addition to an in-depth factual profile of California in the form of a state Almanac, this book offers fascinating and lively discussions of the state's history, people, geography, government, economy, culture, and lifestyles. A section on Notable People, a calendar of events, and enough primary source documents, time lines, maps, and other tools to make this unquestionably the best young adult reference material on the USA available anywhere. Author Ruth Pittman writes with graceful ease and contagious enthusiasm about the missions, the gold rush, the rich cultural diversity, and issues as old as California--water, social programs, the environment, and more.